using the 'Add Key Attributes' button in the note's text pane title bar, and then using the Add Key Attributes pop-over to select and add/delete attributes. The vertical order of displayed (key) attributes can be altered via drag-drop of the attribute name label (left column cell). An item can be deleted from the key attribute display by dragging its label cell out of the table and dropping onto the $Text pane. 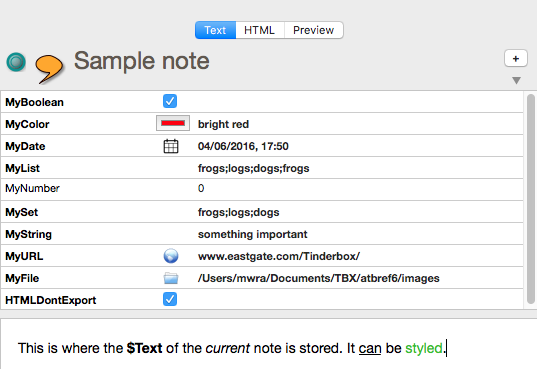 Items in bold are set locally for the note. Items in lighter colour are read-only (normally dynamically calculated values like $ChildCount; pre v6 these were in italics). All other rows in normal text use the default or inherited value. Users coming from older Tinderbox versions should note attribute value data is now fully Unicode. At the extreme the right of the panel each string, list or set attribute has a pop-up list of values, allowing quick setting of values already in use for that attribute. Boolean key attributes are always shown as a tick-box; ticked equates to true, un-ticked to false. Number-type data. Very large or small numbers can be entered/shown using exponential form, e.g. 0.000001 can be entered as 1e-06. Color-type data. The data is shown both as a colour chip (showing the currently set colour) and a string showing the value set which is either a Tinderbox named colour or otherwise a hexadecimal value string ("#330099"). Date-type data. Shows the data and time, with the date in the host OS' short date format, so this will vary by the user's locale - and choice of OS settings. On entering a date, if no time is specified, the time element of the attribute value defaults to current system time. From v6.6.0, a date-picker control is offered to the left of the value box. String-type data. Although generally intended to hold short text values, String attributes can hold larger amounts of text and including line/paragraph breaks. When not selected for edit, all text paragraphs run together. In edit more, the value edit box will only show the first paragraph of text. Use the right arrow to reach first paragraph text overflowing the edit box; use the down arrow key to access paragraph #2, etc. It is not possible to type a line break character in the edit box - but it is possible to copy/paste one into it. URL-type data. A form of string attribute, URL attributes show a globe icon to the left of the data value edit box. Clicking the button will open the URL, stored in the value box, in the user's default web browser. File-type data. A form of string attribute, File attributes show a folder icon to the left of the data value edit box. Clicking the button will open the file (or folder) path set in the value via Finder. Folders will open in Finder and other file formats in whichever app is registered as the default app for that file type. List and Set data. All discrete list values are shown, as a single string of semicolon-delimited values. A note's title ($Name) can be edited directly via the title bar above the key attributes table so there is no need to add it to the table. Key Attributes are sometimes referred to with the shorthand abbreviation 'KA' in help forums, etc. A disclosure triangle allows the visibility Key Attributes table to be toggled, e.g. to allow more space for showing $Text. From v6.6.0, the control is not shown if there are no Key Attributes for the current note. The 'add key attribute' button still remains available. To cycle through key attributes, use the Return key. From v6.5.0 Boolean attributes accept this process; to tick/un-tick a Boolean attribute from the keyboard use the spacebar. click on the line with the attribute to reset, right click and use the 'Use Inherited Value' option. open Quickstamp, select the target attribute and use the reset buttons.